Chosen on EWTN and Parent’s Session now available! Check out Chosen author Chris Stefanick and presenter Father Mike Schmitz on EWTN’s Life on the Rock. Be sure to watch this lively and informative discussion on the urgency of passing along the Catholic Faith to the next generation and how the Chosen program is a perfect fit for the New Evangelization! The Chosen Parent Information Session is a one-hour orientation for parents that can be scheduled prior to beginning the program. Parents will learn about the program and will be encouraged to take an active role in their teen’s faith journey. A downloadable guide and a video (to be played at the session) featuring Chris Stefanick and Fr. Mike Schmitz are available here. In response to the very high level of interest from early reviewers, educators, and group leaders — and to the enthusiasm from various experts involved in the project — Chosen has been produced in two formats: a Confirmation edition and a general Faith Formation edition. 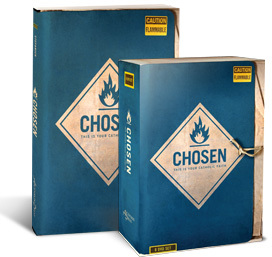 Did you see all the buzz about Chosen this week? If you didn’t, don’t worry! We’ll link you up. The word is getting out about Chosen! Starting April 8th, you’ll probably notice various blogs and outlets posting unique content about the program. As you follow this virtual “blog tour” around the internet, you’ll have a chance to read honest reviews from Catholic bloggers, participate in giveaways, and learn even more about this unique tool for evangelization. Thanks in advance to all the incredible websites hosting a stop on this blog tour! Keep watching – We’ll be linking you to their sites as they share their thoughts with the world.